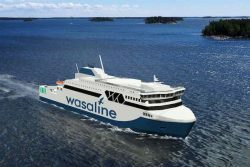 Finnish shipbuilding company Rauma Marine Constructions (RMC) has signed its third letter of intent within a short period, this time for a car and passenger ferry set to operate between the Finnish city of Vaasa and the Swedish city of Umeå. The propulsion system will be hybrid system with a combination of a dual fuel (LNG/Biogas and diesel/SCR) and batteries. The vessel order, with a value of approximately EUR 120 million (USD 137m), will have an impact on employment totalling around 800 person-years. The formal construction agreement is to be signed in early 2019, with the design and construction work set to start immediately thereafter, says Jyrki Heinimaa, CEO of RMC. Delivery will take place latest April 30th 2021. The vessel order comes at an appropriate time for RMC, seeing as the design and construction will mainly be carried out before the construction of the Tallink Shuttle vessel begins. The letter of intent for that ferry was signed in October last year. The new ferry, commissioned by Kvarken Link, will accommodate some 800 passengers and has a freight capacity of 1,500 lane metres for lorries. The vessel will be designed to be environmentally friendly, with a machinery running on a dual-fuel and battery solution, and the main source of fuel being liquefied natural gas (LNG). The vessel will also be able to utilise, for example, biogas (renewable natural gas) produced in Vaasa.